When it comes to commercial stairs for offices and public buildings, there are many considerations, from aesthetic components to functional aspects and other criteria. As one can imagine, staircases in the commercial sector must be code compliant, meeting all safety standards as they relate to the structure and needs of the company. From walking paths and rest platforms to custom railing systems, the industry leading project management team at Southern Staircase | Artistic Stairs leverages extensive capabilities to create commercial staircase solutions of the highest quality with timely delivery from coast to coast. Whether stairs embody a custom design or are prefabricated, commercial staircases for the general public must comply with International Building Code Guidelines (IBC). Notably complex, IBC rules outline the size of stairways as they relate to the occupant load. For instance, stairways need to be at least 44 inches if the occupant load is over 50 and 36 inches if the occupant load is less than 50. In the same way, there must be at least 80 inches of head height (as measured off of the tread nosings), and this should be maintained for one additional riser depth at the bottom of the staircase. Moreover, the riser height must measure between 4 inches and 7 inches, while the treads must be at least 11 inches deep. Other specifications are required for stairs with winders, stair landings and handrails. Given the above-mentioned specifications and measurements, there are also regulations by the Occupational Safety and Health Administration (OSHA) that govern the construction of commercial staircases. As such, stairs are designed to comply with IBC or OSHA safety standards based on their purpose and the environment (think commercial versus industrial). Finally, it’s important to balance expert craftsmanship with artistic vision. After all, a commercial staircase speaks to the prestige of an organization or business, and this is reflected in the style and quality of materials. From inspiration to installation, Southern Staircase | Artistic Stairs creates staircases with stainless steel, glass, hand forged wrought iron, steel and more. Perhaps you already have a design in mind, but there are constraints in regards to space and design. Our knowledgeable staff will help you find a design that is code compliant and visually impactful. From hospitals and libraries to government offices, churches and more, the robust design team at Southern Staircase | Artistic Stairs welcomes the opportunity to work with you. 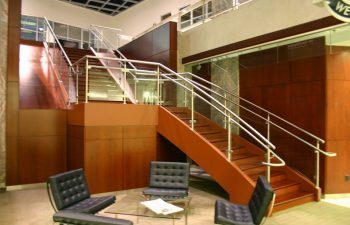 To request a quote or inquire about the stair and handrail system delivery process for your commercial staircase project, call Southern Staircase | Artistic Stairs today.